The Mikayla’s Place Infant Room accommodates children as early as six weeks through twelve months in a safe and secure environment. Infants are encouraged to develop their cognitive processes by exploring their learning environment. Infants will make associations through exploration, discovery, and recognition that are supported through immersion, play and manipulation. Infants are encouraged to develop a sense of the environment around them as well as participate in opportunities to develop their emotions. Our staff indulges the infants in song, dance, and reading activities that illicit emotion, facial expressions, and reactions. Mikayla’s Place offers many activities to encourage infant communication. Our design is intended to develop the “infant’s voice” through singing, listening and making sounds. As your child grows in the Infant Room we assess the development of your child to include language use that includes their name, staff and family members ‘ names, and animal names and sounds. Fine motor skill, which is the manipulation of hands and fingers, is developed through age appropriate stimulation. Our staff offers a number of developmental activities that will assist and encourage your infant. Gross motor skill, which includes reaching, sitting, and crawling, will be developed through a variety of exercises intended to advance your child through a series of progressive steps towards independent walking. The Mikayla’s Place Pre School Rooms accommodate children as early as thirty-six months through sixty months in a safe and secure environment. Our staff provides your child with the individual attention needed to support discovery and learning. 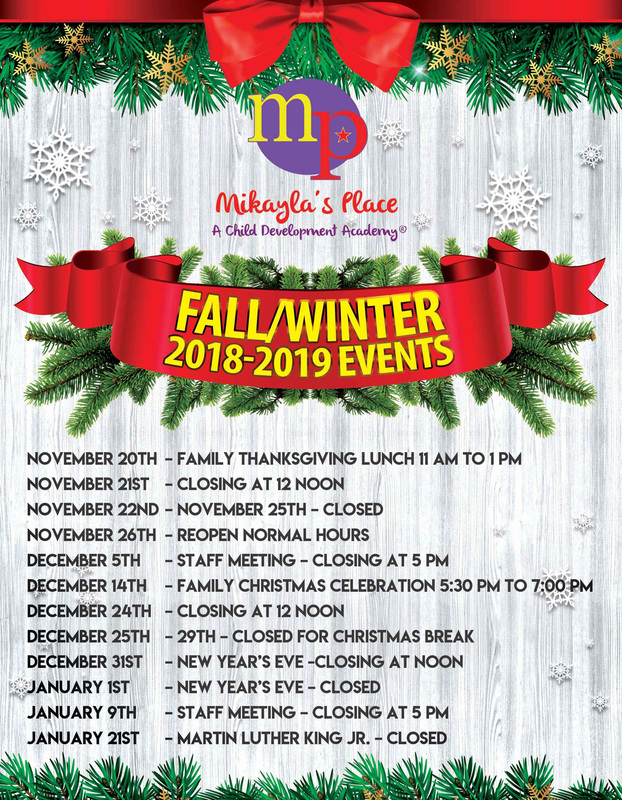 Mikayla’s Place offers a high-quality program that provides your child with a structured environment filled with directed and non-directed academic and socially developmental activities. 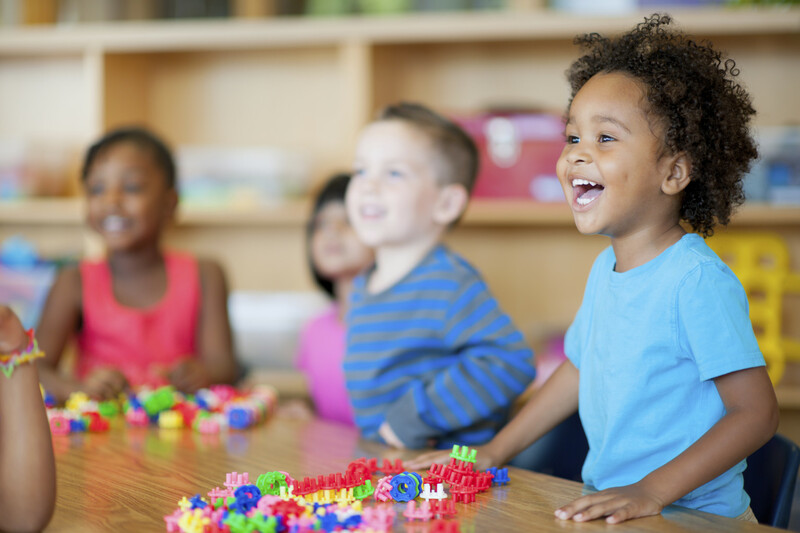 This balanced program contains developmentally appropriate activities that will stimulate your child’s interest and foster his or her social-emotional, intellectual, creative, and physical growth. Children will be encouraged to ask questions, think critically, problem solve, and share his or her thoughts and feelings with the teacher and other students. Each day offers opportunities for children to exercise creative expression through arts and crafts, music, dance, and dramatic arts. Children also spend plenty of time outdoors exercising and gaining new gross motor skills as we play. The Mikayla’s Place Toddler Room accommodates children as early as twelve months through thirty-six months in a safe and secure environment. The toddler curriculum is based on the principle that children learn best through direct, hands-on experiences with people, objects, events, and ideas. Our experienced and caring staff helps to facilitate an actively engaging developmental experience for our toddlers. Through our practice, toddlers are encouraged to discover the world around them by exploring and playing. Learning and development are anchored by long-term, trusting relationships with caregivers, who are close at hand to support the children as they play. Our Toddler Program gives children a sense of control over the events of the day by planning a predictable yet flexible daily routine. The routine consists of arrivals and departures, choice times, group times, meals, and outside times. These common daily events are scheduled to accommodate the eating, sleeping, and bodily care cycles of each toddler. The Mikayla’s Place School-Age Program provides supplemental services to school age children (K – 7) before and after school. Mikayla’s Place School Age Program accommodates working parents as well as provides transportation to and from school. We are proud to provide these services to our clientele. Through the School-Age Program, we are able to offer breakfast, afternoon snack, and dinner to arriving students. Additionally, we provide programming that is important to the developmental, social, and academic well-being of our attending students. At Mikayla’s Place School-Age Program, we provide academic support in the form of homework time and a subject specific tutoring component. Through a partnership with BARAK, INC., we also provide a hefty on site arts curriculum for the school-age children. Mikayla’s Place holds an annual theme based summer camp program for our current after school attendees as well as summer specific enrollees. Our eleven week program provides a seamless transition for students as they move directly into the camp program after the school year ends. Our summer camp participants will have an opportunity to participate in a number of on site and off site activities. Because learning is important to us, our campers and families, campers will participate in the Dauphin County Library Systems’ summer reading program as well as our summer enrichment program which is aligned to state education standards. But what would camp be without the fun and recreation of summertime? Campers will get to swim three days per week and participate in professional art classes several days per week. In addition, our campers will go to the movies, go bowling and skating, participate in a basketball clinic, and remain active with a number of outdoor sports and recreational activities.